Have you heard of chow-chow? If you're on a pickle kick even remotely as extreme as the one I'm currently experiencing, you need to familiarize yourself with it. Apparently, chow-chow is a unique type of relish well-suited for topping a bowl of pinto beans, hot dogs, and a variety of other foods. More importantly, it has a great name. If you like pickled shtuff, you should give her a go. Add vegetables to brine mixture and simmer another 10 minutes. Bring to a boil. Then pack, boiling hot, into clean, heated canning jars, leaving only an 1/8-inch headspace. Place canning lids and rings on jars and tighten. Turn the jars upside down so that all the heat is on the seals and let cool completely. I've been looking for ways to incorporate thick, luscious Greek yogurt (all Oikos, all the time) into my baking, so when I had a few bananas reach the brink of liquefaction, I decided a banana bread was in order. Recalling my concern about the lack of banana-cranberry recipes, I felt that a healthy amount of the little red gems was an essential addition. 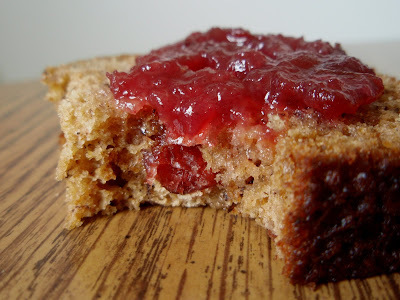 Nooks and crannies and cranberries, oh my! The result? A moist, fragrant, bespeckled bread full of flavor and healthful benefits. So why haven't the sweet, ripe banana and tart, chewy cranberry ever been united in baked bliss? It seems like it should be a good match, and indeed it is. Preheat oven to 325°F. 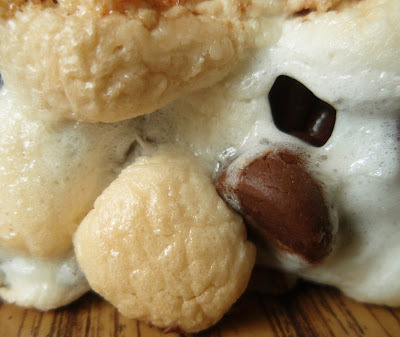 Grease a 9x5-inch loaf pan or a tray of mini-loaf molds. In a large bowl, cream together the butter and sugars. Beat in the eggs, mashed bananas, yogurt, and vanilla. Mix in the cinnamon, salt, baking soda, and flours. Stir in the dried cranberries. Divide appropriately into prepared pan(s) and bake for 70 minutes or until inserted toothpick comes out clean. My respect for the Amish has just risen, and it's all due to an idea that may or may not have even started with them. I know you've heard of Amish Friendship Bread, the chain letter of the baking world. Although I don't have the actual starter used for such breads, I do have Eb, and he hasn't let me down yet. The most exciting thing for me about this notion of Amish Friendship Bread isn't the fact that you're supposed to pass some starter on to friends and neighbors. Nope, what thrills and interests me is the fact that pudding mix is involved in the recipe. Does it add moistness or bulk, or is it merely there for a little extra flavor? After one go-round, my theory is that it's there for all of the above reasons. The bread is definitely moist and dense, more so than what I usually find in my sourdough breads. Further, the flavor provided by the pudding mix (coconut cream, in this fabulous case) was the best part of the final product as far as I'm concerned. Heck, just think of the variations here! This time, I used coconut cream pudding, macadamia nuts, and white chocolate chips. Next time, I'd like to try butterscotch pudding with toffee bits and dark chocolate. There's banana cream pudding, oreo pudding, pistachio pudding, lemon pudding, white chocolate pudding, cheesecake pudding. So many nuts, so many baking chips, so many possibilities. Just thrilling. This particular version was amazing--it disappeared so quickly at work that for a moment, I was afraid someone had just gone ahead and dumped it all in the trash (what can I say, that's the way my mind works). 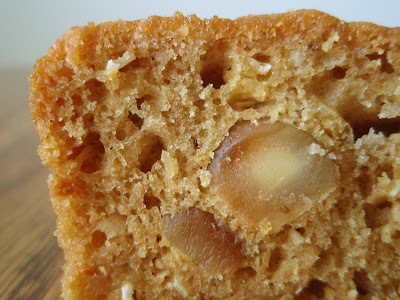 The macadamias provided a nice salty crunch, and the white chocolate chips were there for a pleasant burst of sweetness. 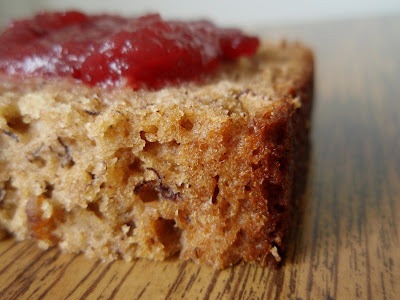 As I'm a big fan of coconut (not only eating it, but also smelling like it--I consider it a wonderful incentive to wear sunscreen), the fact that its subtle but distinct flavor permeated the loaf was the best part for me. Say...do the Amish even use store-bought pudding mixes? 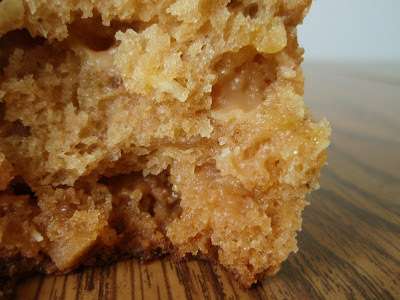 I resisted making the snickerdoodle blondies that've been spreading like wildfire in the Land of Food Blogs for quite some time because I knew they'd be addictive and I knew I'd never look at normal blondies the same way again. I was right. Regular blondies are worthless to me now. Where do I begin? Let's start with what these bars are like before they're even baked. I'm not gonna deny that chocolate chip cookie dough isn't good, but it truly pales in comparison to this raw batter. It's seriously tasty. Secondly, I need to tell you about the aroma. 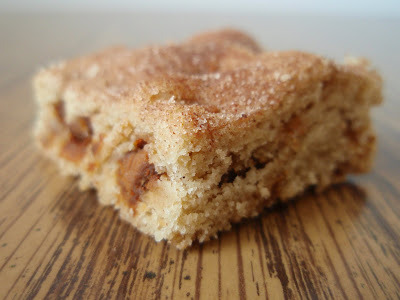 As you know if you've ever stopped by this blog even once before, I'm addicted to cinnamon. I defy any among you to tell me that you don't enjoy the smell that wafts out of the oven as anything involving cinnamon bakes. 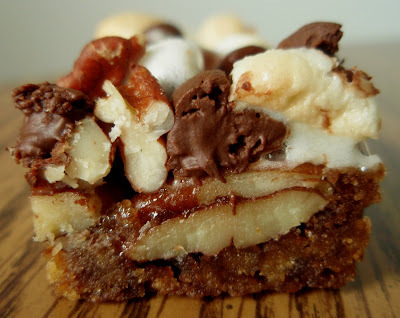 It's undeniably swoon-worthy, and these bars are no exception. Even as I was cutting them, the scent worked its way into my nose and I more than once felt the urge to pause and have a bite. Finally, the ultimate test--the flavor. As far as I'm concerned, the taste of these bars is supreme. 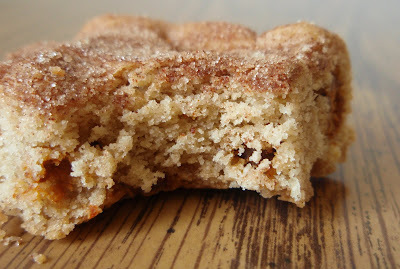 The texture is right, the cinnamon dosage is perfect, the cinnamon chips are a welcome addition, and the cinnamon sugar is the icing on the cake (or the dusting on the bars, as the case may be). The moral of this story--as long as I'm baking just for myself, another blondie recipe will never again be necessary. This one wins. Preheat oven to 350F. Spray down an 8x8-inch pan. Mix together the flour, baking powder, salt, and cinnamon; set aside. In a large bowl, cream together the butter and brown sugar; beat in the egg and vanilla until smooth. Combine the flour mixture and the wet mixture and mix until well-blended. Stir in the cinnamon chips. Spread the thick batter evenly in the prepared pan (and do it quickly so you're not tempted to eat it all before it's baked). Combine the sugar and cinnamon in a little bowl and evenly sprinkle the mixture over the top of the batter. Bake 25 minutes or until surface springs back when gently pressed. Cool slightly. 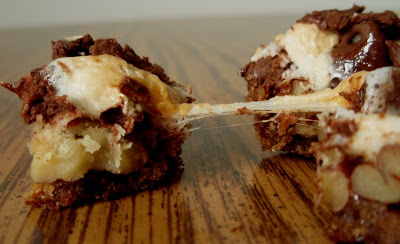 While still warm, cut into bars with a sharp knife. I recommend doing this with a clothes-pin on your nose. It's extremely easy to buy barbecue sauce at the store. Well, actually, I take that back--there are so many appetizing varieties available that it becomes a little challenging to choose just one. But that would be the only hurdle. Still, I enjoy being in the kitchen (obviously) and I enjoy eating homemade things, so I thought I'd try my hand at making my own barbecue sauce. Guess what. 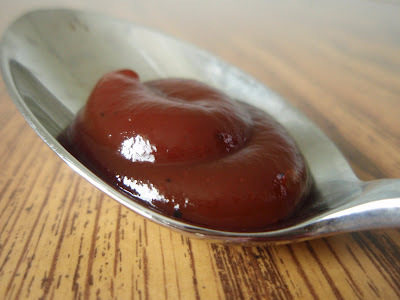 It's also extremely easy to make barbecue sauce at home. What's more, you can fine-tune it and toss in whatever tickles your fancy (and leave out whatever doesn't--no preservatives or modified starches in my blend, thank you very much). My fancy just so happens to be tickled by both heat and sweet, so I included ample amounts of the ingredients necessary to achieve these qualities. 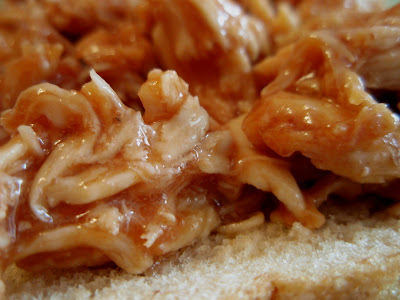 My sauce made for a mean chicken barbecue sammich. Combine all of the ingredients in a saucepan and slowly bring to a boil. Reduce the heat and gently simmer until dark and thick, 10 to 15 minutes. 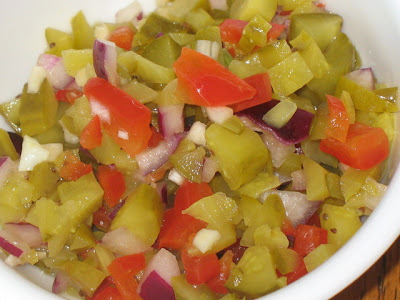 Transfer the sauce to a clean bottle or jar and store in the refrigerator, where it will keep for several months. 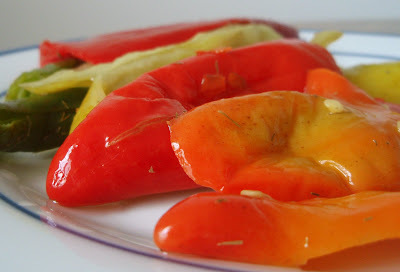 ...but I did pickle some peppers. I dill-pickled 'em, to be exact. 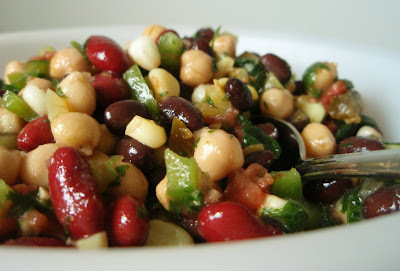 This endeavor was triggered by a pickling post I recently saw on The Kitchn and my never-ending love for dilly beans. 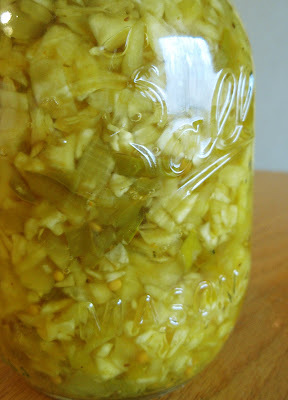 -I prepared the brine recipe perfected by my Mamoxicillan, and heated it to its boiling point. Yes indeedly, pickled peppers please my palate, even if Peter Piper didn't pick a peck for me.